If there is an independent comic that can compete for general dominance with The Walking Dead, it’s Bill Willingham’s Fables. A few years ago, before Once Upon a Time and Grimm both moved in on the territory at once, Fables was being considered for television. That never quite happened, obviously, perhaps because it was still a little before shows based on comics had really gained traction. So it’s a bit of a thrill to see the world of Fables brought to life in another medium, and who better than Telltale to do it? But with the final episode of the first season of The Wolf Among Us, “Cry Wolf”, out this week, we can look back on the whole story, complete – and, more than The Walking Dead, this is a story that works best as a whole. 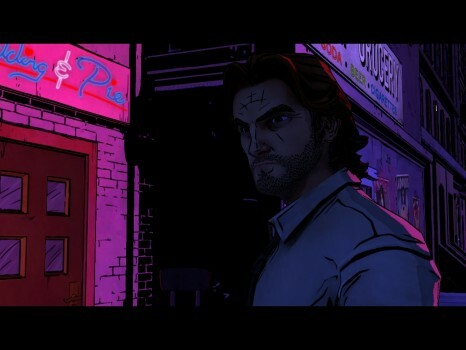 Like the comic series itself, The Wolf Among Us is fantasy noir. The premise, from the comic series, is that the Fables – characters and creatures from fairy tales, nursery rhymes, and the like – had to flee their otherworldly home to take refuge in our own world, specifically New York, where they live mostly in an area of the city they clandestinely call Fabletown, using magic to appear normal. Fables who cannot (or will not) disguise themselves as humans get sent to the Farm, a place out in the countryside where there are fewer prying eyes. Fable society is starkly separated into the haves and have-nots; some Fables lost everything when they fled the Homeland. Some simply don’t have the good fortune of looking very human. Bigby Wolf is Fabletown’s sheriff, so when the head of a murdered Fable turns up on the front porch of the apartment building, it’s Bigby’s job to get to the bottom of it. Telltale’s style certainly begs to be used for a mystery with plenty of twists, turns, suspicions and suspects, and The Wolf Among Us delivers on that. Other Fables see Bigby as little more than the lapdog of an ineffectual government, and cooperation is rare. Frequently at least carrying one of his favorite Huff-n-Puffs, he’s more the hard-bitten private detective than the badge-wielding procedural policeman. As a prequel to the comic, fans old and new can enjoy Bigby’s adventure. Bigby’s actions matter, and they matter beyond the climax of each episode. He’s not fighting for his life (at least not always), but doing his job, and why he bothers is a question that more than one character poses to him during his investigation. Is it a sense of attachment to the murdered girl? Is it white-knighting for the benefit of Fabletown’s deputy mayor, Snow White? Is he just trying to protect the idea of Fabletown? Hell, is Fabletown even worth protecting? The best game narratives make us consider, really consider, our opinions on complicated matters in ways that no other medium quite can. 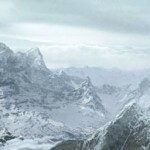 Even in a game without functional agency, the fact that we, as players, must act on whatever belief our avatar holds in the story, but mostly we can compartmentalize that as being what we are “supposed to do.” But games like Telltale’s ask us these questions and ensure us that, at least sometimes, our answers have consequences. This isn’t, at this point, new, but The Wolf Among Us does it very, very well. We expect world-shattering choices after the heavy hitters of the emerging interactive narrative realm. The moral quandaries we usually face are inconceivably huge, life and death and genocide. The tiny choices that only profoundly affect one or two lives are just filler, ways to fill our Paragon meters. But those are the choices that The Wolf Among Us thrives on. Despite being inhabited by fantastic characters, the situations are more down to earth, and more dramatic for it. Whether or not to have a character who can’t afford a glamor (a spell that disguises them as a human) shipped off to the Farm is built upon over several episodes instead of a single scene or side quest. Whether to take a hard-line approach to solving the crime or try to act more reserved matters, too, especially late in the game. After confronting Fabletown’s secrets, its flaws, its inequities, repeatedly, The Wolf Among Us will make you consider all that you’ve learned and where, after everything, you stand. And for at least a moment, you won’t be. Mirror, mirror, this truth unveil: how might I reach Dix by mail? Never really had any doubt that I’d buy this, though I was waiting for the full season for all the same reasons you cite in your review. What you’ve given me here is an even stronger justification for buying – I love the Fables trades I’ve read, I love Bill Willingham’s writing and dialogue. I love how he made it work when it could have not worked. I love the humor inside the pathos, I love the context, the setting, I love everything about it. And based on your fine review, sir, it sounds like the Telltale folks really get what I love about it. Couple questions: how closely did Willingham collaborate on this? Do we know how many seasons are planned? When does Season One take place within the comics continuity? Is this post-Adversary, or is it set in the earlier period? Please note, it is on sale for 50% off on Steam for now, so you should get it within the next day for the savings. Willingham is a consultant on the game. You can hear him talk about it a bit in this interview starting at about 5 minutes in: http://www.nerdist.com/2014/04/bill-willingham-talks-the-wolf-among-us-end-of-fables/ He sings the praises of the writing team considerably, and makes the point he did not write the game, but that Telltale’s “storytelling geniuses” did. I don’t know how many seasons are planned. Like previous Telltale seasons, the season’s story could stand on its own, but there’re definitely unanswered questions and I think season two is definitely going to happen. Season One takes place in the mid-1980s, which puts it a while before Fables proper. Some parts of the status quo are not quite in place yet, but Fables have been in our world for a while now. It does not do more than passingly mention the Adversary or what caused them to flee the Homeland, really just enough to justify why they are in our world and why some of them are more destitute than others. Great review, Dix. I haven’t had time to play the last episode since it came out this week so I don’t have any thoughts on that yet. I do know that they left an awful lot hanging on this final episode, so my expectations are high. As much as I’ve enjoyed each episode of The Wolf Among Us I would not personally recommend that others go out and play it immediately unless they’re going for the PC version (which I assume doesn’t have the problems the console versions do). I’ve been playing it (as well as Season 2 of The Walking Dead) on PS3 and the performance issues that we saw with TWD Season 1 are not only present but worse. To me it’s unacceptable and for me greatly colours how I view the end product. As a largely cinematic, narrative experience dependent upon a smooth flow it has been hindered by the long load times and, much worse, the in-game choppiness issues. So unless you’re going to play it on PC (and by all means, someone please confirm if PC versions don’t suffer the above problems??) I highly recommend waiting until it is inevitably re-released on PS4 and Xbox One. If I were a critic at a number-awarding publication I would slash my score in half because of these problems. With words I’d simply say don’t play the PS3/360 versions. They don’t do the glowing content justice, and in fact may sour you on the whole thing. The same goes for TWD Season 2 which is just as bad. I played on PC (and have only ever played on PC). Nothing struck me as technically insufficient in that regard. Thanks for the review! I played on PC with no problems. I also went into this not having read any of the comics since the first year. Found it wonderful and very accessible. With this and walking dead, I also love seeing the choice stats after each episode. It’s reassuring to my sense of humanity if most players made what I consider the “moral” choice, but sometimes I Find myself in a small percentage of choice takers and think, “is there something wrong with me? ” I love that added psycho – social dynamic. I’m especially fond of those times when I see that I’m in the minority on a choice, but I’m not sure if that’s because I’m morally superior or a complete monster. Go with monster it’s more contemporary. I dunno I kind of like dark games. While I’m a fan of Telltale’s work, and have appreciated Willingham since the days of The Elementals, there are a whole lot of comics I’d rather seen done in episodic fashion than Fables. For instance, just off the top of my head: Hellblazer, Warren Ellis’s Gravel, The Invisibles, an original story by Ed Brubaker, Greg Rucka, Brian K. Vaughan, the J.E.B. Stuart/Haunted Tank stories…the list is long. Heck I would LOVE to see Telltale take on Jack Kirby’s Inhumans. But I can understand that as a business decision Fables would seem to present well to a target audience of significant size. My question: is The Wolf Among Us better written than Fables? I don’t mean to insult Willingham; it’s just that, as I tell my spouse occasionally, Telltale’s The Walking Dead is far better than the comic or the TV show. I’m not saying dark is inherently bad – and The Wolf Among Us definitely IS dark – but as tastes go I find that that is an immediate turn-off for some of the people to whom this type of game would otherwise appeal. As to writing quality…it’s been so long since I’ve read any Fables, frankly, that I’m not really in a position to compare well. Easier perhaps to say the writing is on par with what The Walking Dead might lead you to expect.